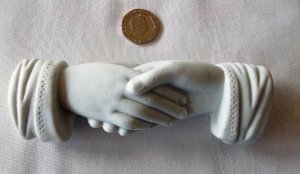 In our view these lovely Victorian clasped hands in purest white parian ware would make a perfect wedding gift. And when, with the passage of time the clasping of hands, nay the clasping of any other parts of the anatomy, has ground to a slightly embarrassed halt – they will not make too large a dent in the head of the partner at whom they are thrown. They are well nigh perfect apart from the odd firing bubble and we have to admit they are a tad grubby. We don’t wash, dust, polish or scrub the stuff we sell – that’s your job.